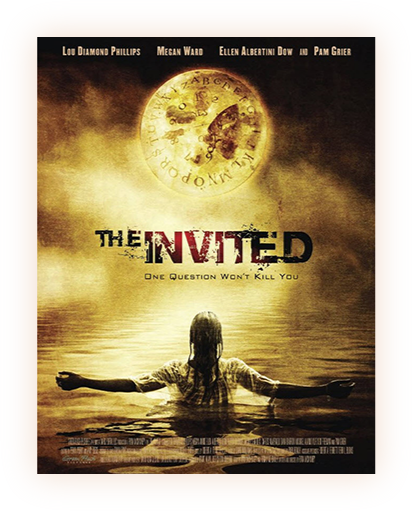 "THE INVITED" (previously titled "The Conjuring") is a horror film set in in the foothills near the Gold Rush town of Placerville, California. It involves a young married couple who are pregnant with their first child. After moving into their turn-of-the-century home, they discover evil has resided there for nearly a century, unleashed by a previous occupant. In cleaning out antique items left by the previous residents, the wife comes across a "game" created by a young woman in 1920 - a spirit board. Conflict ensues when the husband forbids the wife from playing with it. The naive wife fails to respect his warnings and all Hell is unleashed into her life, robbing her of all she holds dear. Her life and soul soon hang in the balance. Cast: The film includes Lou Diamond Phillips, Megan Ward, Victor Browne, Jacoby Shaddix (frontman for Papa Roach) in his film debut, and Ellen Albertini-Dow.